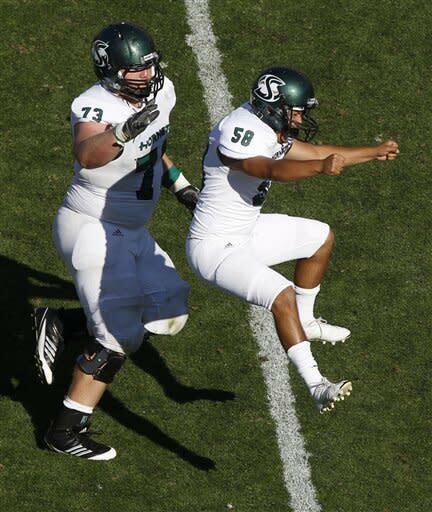 BOULDER, Colo. (AP) -- Walk-on Edgar Castaneda's 30-yard field goal as time expired gave Sacramento State a stunning 30-28 win over Colorado on Saturday - and earned him a scholarship in the process. Castaneda joined the Hornets after helping City College of San Francisco win the junior college national championship last season, but he was paying his own way until Saturday, when his first game-winner at any level earned him not only a hug from coach Marshall Sperbeck, but also an education. Sperbeck made the announcement during his postgame speech in the Hornets' locker room. The Hornets (1-1) also left Boulder with a $460,000 paycheck following a stunning victory at a Pac-12 stadium for the second straight season. They upset Oregon State 29-28 in overtime in last year's opener. The Buffaloes (0-2) fell to 1-2 against FCS-level opponents. 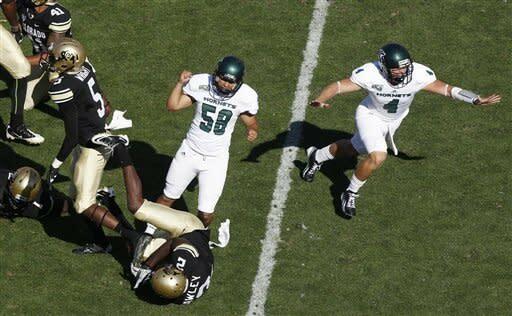 They also lost to Montana State at home in 2006 and edged Eastern Washington by a touchdown two years later. Trailing 28-27, the Hornets got the ball at their own 15 with 2:26 left and marched downfield for the game-winner by Castaneda, after which wide receiver Austin Dotson did a series of backflips as his teammates swarmed the field. Sophomore Garrett Safron threw for a career-best 312 yards on 25-of-37 passing for the Hornets. On the game-winning drive, he completed four passes totaling 53 yards and his receivers drew pass interference penalties on his two other throws, accounting for another 15 yards, as the Hornets reached the Colorado 17. From there, the Hornets ran three times before calling timeout with 1 second left for Castaneda, who also was good from 28 and 31 yards. Morris Norrise caught seven passes for 104 yards for Sacramento State and Chris Broadnax had five catches for 92 yards and a touchdown. 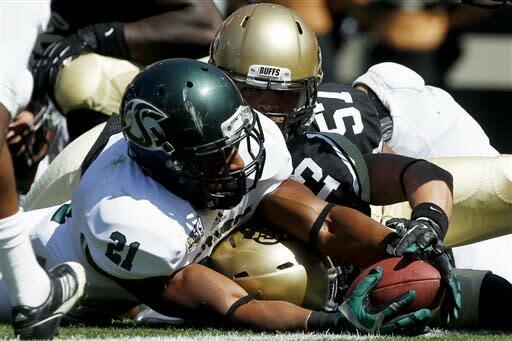 Colorado freshman fullback Christian Powell ran for 147 yards and three touchdowns. After getting just one carry in a loss to Colorado State last week, Powell burst up the middle on his second carry Saturday for a 64-yard touchdown, then added a pair of 1-yard scores. Down 14-0, the Hornets got a pair of TD throws from Safron and a 2-yard TD run by A.J. Ellis to take a 21-14 lead. The Buffs tied it on Jordan Webb's 9-yard TD toss to Kyle Slavin. Powell's third TD put the Buffs ahead 28-24 in the third quarter after Castaneda's 28-yard field goal gave Sacramento State a 24-21 halftime lead. Castaneda's 31-yarder pulled the Hornets to 28-27 with 12 minutes left. The teams exchanged punts on the next five possessions before the Hornets got one last chance and went 77 yards in nine plays.